I’m enveloped in a blanket, thankful that I don’t have to go out in the frigid cold. My mind wanders back to a meal I had weeks ago at Q by Peter Chang. 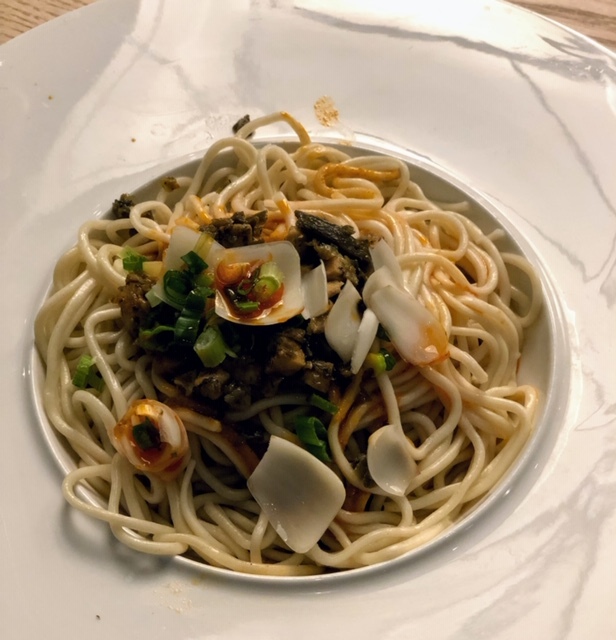 And if I was willing to brave the cold, I would venture out to Bethesda where the venerable Chef Peter Chang and his team are currently offering a sultry selection of hot pots, soups, and stews. While warmer weather is on the way, it’s February, and obviously we’re not done with winter. Diners can seek comfort at Q by Peter Chang with seasonal specials including lobster noodles, Yangtze River Beef, Chang’s Lion Head soup, duck lotus root stew, stir-fried yam and cabbage, or smoked pork belly and meat ball stew. Chang describes his cooking. 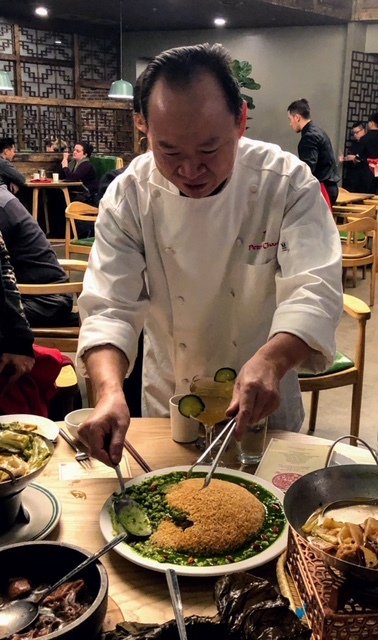 “My food has a soul that is 100% Chinese, but these dishes can’t be found in China.” His words are translated by his daughter Lydia, who manages business operations, and is a visible presence in the restaurant. The chef expresses concern that sometimes his food may be considered too Chinese for Americans. My dining companions and I emphatically disagree. 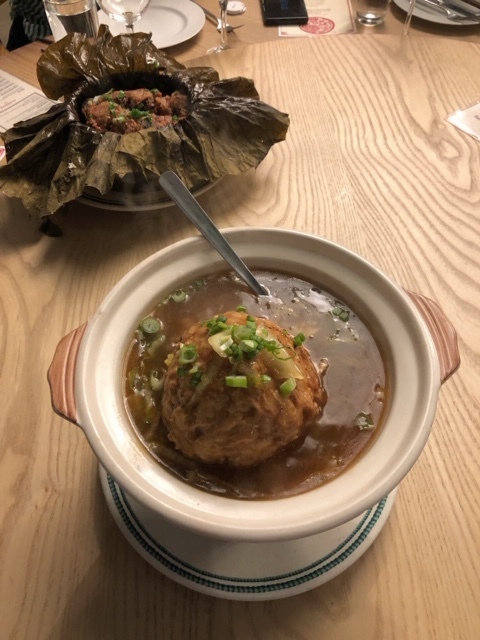 Chang’s Lion Head features a single giant pork meatball in a savory golden broth. The lion symbolizes strength, stability, and superiority in Chinese culture. The chef says that the soup symbolizes unity among family, and prosperity for the coming year. As I peek out from my blanket to review the photos from my meal, I feel much like the tender short ribs wrapped in lotus leaves. Its another demonstration of warmth and coziness provided by this current crop of featured dishes. A stew of house-made smoked pork belly and meatballs consisting of both fish and pork, bubbles in a wok set over a flame. It entices with its aroma and dramatic swirls of smoke. Yangtze River Beef sizzles under a bed of fresh cilantro. 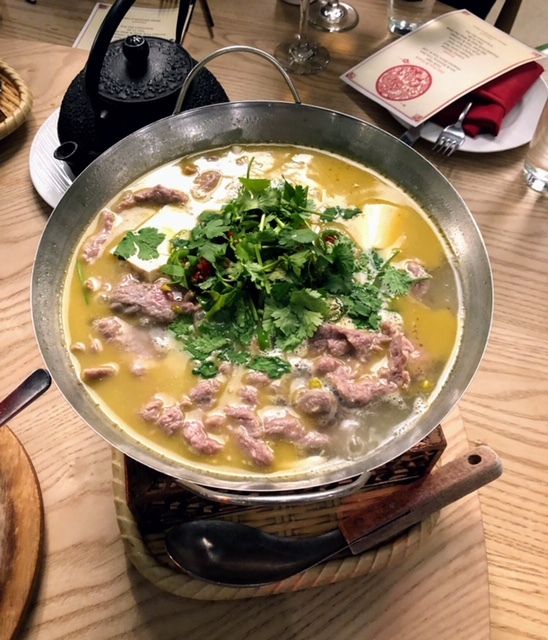 The hot pot dish explodes with flavor, the result of a mingling of red chilis, green pepper, and numbing spice. For diners with an unlimited tolerance for heat, nothing hits the spot like Hot & Numbing Tofu Skin. The spice level is no joke. Your entire mouth will be numb for a while after consuming even a few bites, so take a break to allow your palate a chance to recover. However, if you love spice, as I do, don’t miss this. Tian Di He is the chef’s ode to heaven and earth. A rice cracker dome represents heaven, and the green represents land and grass. Its healthy ingredients include white pearls made from chicken puree, ginseng, kale, and goji berries. Heavenly. Chef Chang is evolving his dishes throughout the winter. Fish Cake Hot Pot with Vermicelli & Sour Cabbage Broth is new on the menu. Go now, as these dishes will only be available into March. The weather is unpredictable at the moment, but there’s a guaranteed heat wave at Q by Peter Chang. Don’t miss it. 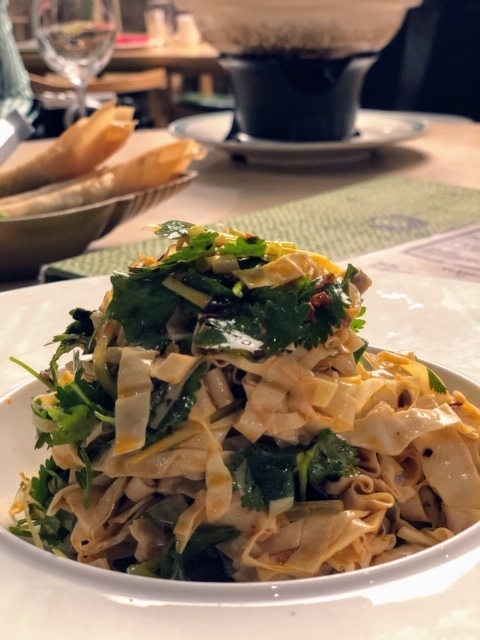 Q by Peter Chang opened in Bethesda, Maryland in May 2017 and serves as the flagship restaurant for legendary Chinese Chef and Restaurateur Peter Chang. Hailing from Hubei, China, Chang focuses on serving guests signature Szechuan dishes as well as an assortment of authentic Chinese fare. Q by Peter Chang is open seven days a week for lunch and dinner , and offers a Dim Sum Brunch on Saturday and Sunday from 11AM-3PM. Scheduled to open in Fairfax City in Virginia in Winter 2018/2019, Mama Chang – an original culinary concept from Chef Peter Chang – will pay homage to all of the Chang women and their recipes including Peter’s grandmother, mother, wife and celebrated Chef Lisa Chang, and daughter Lydia Chang. The modern upscale casual restaurant will be open for both lunch and dinner with plans to launch brunch after the opening. Mama Chang will specialize in home-style dishes and will offer both beer and wine at their bar.